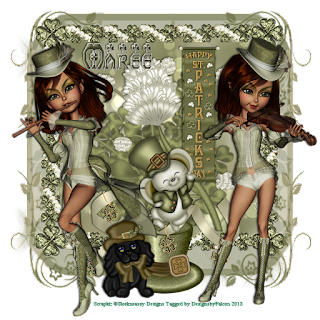 PTU Irish Maiden created by SleeknSassy Designz. You can purchase this beautiful kit at Scrappindollars . You will need a license to use this artwork. This was written with the use of PSP X5. You may recreate it any version of PSP. New transparent raster layer 800 x 800. You can resize or crop later. Open IM_Element15 c/p as new layer move toward top of layer. Adjust-Add Noise Uniform 50%. 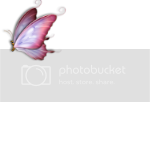 Click in frame with Magic wand Selections-Expand by 5 new layer. Open IM_Paper11 paste copy paste into selection, deselect then drag below frame layer. Open IM_Element33 c/p below frame layer add a drop shadow. Open IM_Element39 c/p move to right of layer resize 55 percent, add drop shadow. Open IM_Element8 c/p move down from frame reisze 45 percent add drop shadow. Open IM_Element16 c/p move place on hat resize 65 percent add drop shadow. Open IM_Element11 c/p resize 35 percent move to left bottom of hat add drop shadow. Open IM_Element1 c/p arrange on top of ribbon resize 45 percent add drop shadow. Open IM_paper7 c/p on background layer add your mask of choice.Merge group. Open MBW-Irish Maiden02 c/p move to left of layer add drop shadow. Open MBW-Irish Maiden01 c/p move to right of layer add drop shadow. Add your Artist © and your name then crop or resize. Thank you for trying my tutorial, I hope you enjoyed it. so that I can show them on my Blog. Tutorial by © Maree *(DesignsbyFalcon) 2013. Welcome to my blog my name is Maree. I am married to my hubby have been blessed with 3 children and we now have 3 beautiful grandkids to spoil.I started Psping for about 8 years now. I started with a lovely lot of ladies who encouraged me to create tags and shared them with peeps.Now I am writing tutorials to share with you.Happy Psping. Click on tags to view full size. These are all my creations and any similarities are purely coincidental. What you create is yours but no Monitory gain is allowed.Please No Hotlink as it is prohibited. Do not upload my files to any other site. If you are a group manager and wish to use my tutorials in your groups you may but only as a link back to my site.